One human was harmed in the making of this dinner. Messing up what was otherwise a perfectly vegan meal, I seared a thick cut of pork loin before adding the metal-handled pan to a hot oven so it could cook through. Once it was done, I pulled the pan out to the stovetop and removed the meat to a plate with tongs – so the juices would settle before slicing. Moving quickly along, my next step was to use that same pan to simmer the garlic for the recipe below. And so I shifted the pan over to the other bur…OUCH! I skipped a step and didn’t use a pot holder! Make sure there’s no broken skin or serious blistering. If there is, seek medical help. Run your hand under cool (not too cold) water for 10-15 minutes to stop the active burning. Bandage any broken skin with clean and lint-free cotton. If there’s no broken skin, that aloe vera plant you’re growing might help. Take an ibuprofen or aspirin for the pain. Update your Facebook/Twitter status to reflect your epic failure. And lastly, keep cooking dinner. You’ve put your body into this meal! 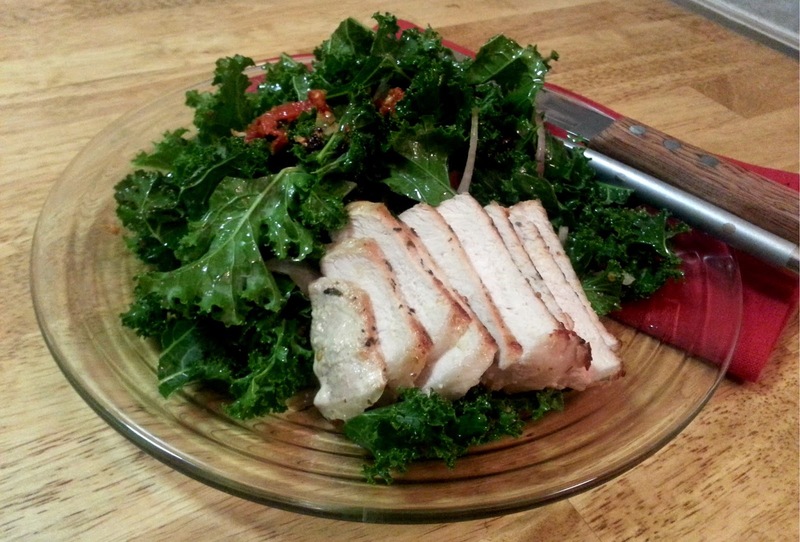 One added benefit of a kale salad: since the greens are so hardy, you can dress the salad at dinner and bring leftovers for lunch the next day. This recipe is for two large and healthy servings. Wash kale in a large bowl of cold water. Stir to release the dirt, replace the water, and repeat until there’s no grit left. Rip out the stem and center vein of the kale with your hands – they will give your jaw a workout if you’re eating this raw. Rip or cut leaves to your desired size for the salad. Add to a large salad bowl with red onion, sundried tomatoes and cranberries. In a shallow frying pan, gently cook garlic in olive oil until just tender but not darkened. Pour hot oil over kale, tossing to distribute. Toss with vinegar and season to taste with salt and pepper. « Got Leftovers? Make Croquetas!